Lady Allis nearly swoons when she first sees the tall, tempting knight at her father's jousting tournament. As the eldest daughter of the family, she is duty-bound to wed someone of wealth and privilege -- and Sir Connor, though mesmerizing, is not only penniless but in disgrace. To Connor, this fiery, untouchable maiden is a prize worth fighting for. The onetime hero has little save his pride and his skill -- as a warrior and a lover. But will that be enough to survive castle treacheries, to know the rapturous passion the lady's hungering gaze promises -- and to win her heart? 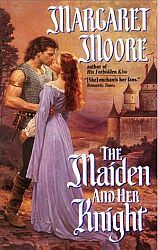 THE MAIDEN AND HER KNIGHT is the first book in the medieval trilogy Margaret wrote for Avon Books. The second book is TEMPT ME WITH KISSES. The third is ALL MY DESIRE. "A fast read laced with passion, this is an entertaining romance with a strong mystery subplot featuring an unexpected twist at the end."